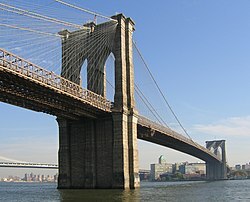 Brooklyn (/ˈbrʊklɪn/) is the maist populous o New York Ceety's five burghs, wi approximately 2.5 million residents, an the seicont-lairgest in aurie. Syne 1896, Brooklyn haes haed the same boondaries as Kings County, which is nou the maist populous coonty in New York State an the seicont-maist densely populatit coonty in the Unitit States, efter New York County (Manhattan). It is the wastmaist coonty on Long Island.